Last week was a big one in the VanderMeer household. 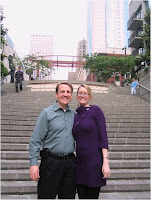 It started with my husband Jim and I celebrating our anniversary by having dinner at Wild Ginger in Seattle. I'd never been, and it was fabulous! We also celebrated my birthday. My kids and my hubby make my birthday feel like a major national holiday, so I look forward to it every year. After a really special day together, I went to bed feeling like a rock star. Then there were the birthday celebrations with friends! Martha (you'll see her photo soon when I do a post about her) and I went to lunch on Wednesday, and Debra and I went to dinner on Friday. Debra and I walked down by the boats while we were waiting for our table. 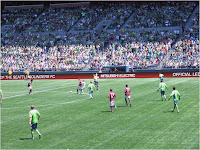 To finish off the week, we went to our first Seattle Sounders soccer game on Sunday. It was so fun! Those guys are amazing athletes! The news that I'm a finalist...HUGE. When the phone call came, I was at Safeway. 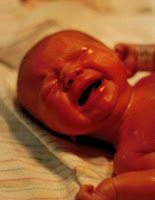 My son called me on my cell and told me that I'd better come home because someone from PNWA called about the contest. I wanted to abandon my grocery cart, but I had to finish shopping. We were having a dinner guest from Jim's NY office and I was pressed for time. I not only had to make dinner, but I wanted to make it appear that we live in a clean house. My daughter called when I was in the car. She'd been given the message that I was a finalist, so we screamed briefly into the phone together then hung up so I could get home. When I pulled into the garage, the kids ran to me and we all stood there, screaming and hugging. It was so cool. My first point is that my kids are awesome. Only certain people "get" what a big deal good news is in the writing world. My family is in the thick of it with me, and they totally get it. Which leads me to my next thought: to remember to strike a balance. It's so easy to get wrapped up in our novels--and it's also necessary. We need to place ourselves inside our characters to see them as real people and be able to write them well; we have to be so absorbed in them that we can clearly imagine their lives before, during, and after our books. There is something enormous within each of us that drives us to spend countless hours getting our stories down on paper, polishing them, and sending them out, knowing the odds. In doing so, however, I never want to miss out on the very real lives of the people whom I love every day of the year, birthday or regular day--big week, dull week, or bad week. I hope when my kids are grown, they feel I succeeded in the balance category; my family, after all, matters more to me than anything. My third point is about celebrating. This is a tough industry, so I think all the good moments should be appreciated if not celebrated. And "good" is a big word. First rejection letter? Welcome to the club. There's a fraternity of writers surrounding you who applaud your efforts. How about when you start to get good rejection letters? And yes, there are such things. If it is personalized, gives advice, refers you to a colleague, or invites you to send future work, it falls into the "good" category. First finished draft of a manuscript? A partial or a full request from an agent? These moments are worth embracing. This is just one literary contest and the odds are that I won't make it beyond the finalist stage. But I hope I will. I wouldn't have entered if I didn't have hope. I also hope I get an awesome agent before long, I hope I get a book deal after that, and I hope the book deal kicks off a long and successful writing career. For now, though, I'm just psyched to be a finalist, and I'm so touched that my kids screamed with me in the garage. Yeah, it was definitely a great week. I found out yesterday that I'm a finalist in the PNWA Literary Contest! I'm so excited! I’d entered the contest with my manuscript, PERFECT VISION. The top three winners in each category will be announced at a dinner on August 1st. Cross fingers! But you never say a word. We went to New York for Spring Break, and I fell in love with New York City the way people fall in love with human beings. 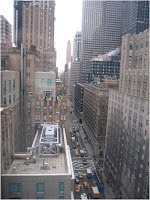 I'd been only twice before--when I was eleven and when I went for the SCBWI Winter Conference in 2007--but I had hardly seen more than the hotel in 2007, and I haven't been eleven for...uh, a couple years. I am one of the first members of my family to be born outside of New York and Massachusetts since my grandparents and great-grandparents arrived in the U.S. way back when, so even though we were total tourists (except for my hubby, who had to work one day), I could somehow feel my roots. And it was such a blast being there! The photo above is the view from our hotel room. Whenever we weren’t out exploring, I found myself glued to a window. I'm clearly not the only writer (or artist or actor) to visit New York with huge hopes for the future. When we were there, I was like a walking, talking cliché, drooling over the publishing houses we stumbled upon. This is me outside of Simon & Schuster. Note that nobody is actually inviting me in. Of course, it was nighttime, but my point is that they haven’t heard of me. Yet. Hee! A girl can dream… When I emailed this pic to my critique group, my subject line was “Me Likey”. While The Dream is a huge reason NY is so exciting to me, it’s not the only one. I love the smell of the street vendors' hot dogs, walking in the crowds between the buildings, and all the energy. I also love the subway! If I lived there, I'd be eating street hot dogs, riding the subway for fun (yes, I'm that geeky), jogging in Central Park, and staring out my windows at the people and the motion whenever I wasn’t writing. I like the crowds, the sirens, the way it rains (different than Washington rain), the way it smells (even the smell of the subway, except for the day it smelled like vomit), the skyscrapers, the grid, the history, and the way it allows me to feel both sides of my family in the same place. I'd love to live there someday, even if only for a few months. The cost of living... Well, I guess I wouldn't have much time to eat street hot dogs, ride the subway for fun, jog in Central Park, and stare out my windows because I’d be working two jobs on top of my writing. But it's a dream world for me. I feel like I'm a part of the fabric when I go there, even as a tourist, because of my family; I hope to become a bigger part because of my writing. Today was my kids’ last day of school, so tomorrow is the first official day of summer vacation! My son made this summery picture for me. Feel free to admire it. Frank Portman’s agent is Steven Malk, and Steven Malk has an amazing list of clients. Thus, it feels like a safe bet. Vanilla Frappuccinos are totally delish. Any Frappuccino makes me happy. Thus, if feels like a safe bet. Does the thought of query letters give you headaches, indigestion, or mysterious rashes that can only be cured by consuming large amounts of chocolate? If so, combat your fears by taking advantage of the resources around us. Agents themselves provide priceless information. If you haven’t already, check out Nathan Bransford’s posts Anatomy of a Good Query Letter I, Anatomy of a Good Query Letter II, and Hoops vs. Hints. Agent Kate Schafer Testerman sometimes does a live-blog, commenting on queries she receives. While keeping the letters anonymous, she explains her decision-making process. Some agents who blog post client query letters that grabbed them, and some agents, while speaking at conferences, share examples of quality query letters they received (with client permission, of course). We writers can learn from all of this. We can also learn from each other. While I’m currently “agentless in Seattle” (or near Seattle, if you want to get technical), I’ve learned a thing or twelve about query letters. I’ll share a few with you today. All three involve time. Write your book blurb as soon as you finish the first draft of your manuscript. The blurb, the paragraph in the query letter that tells about your book, is so important. It’s also difficult to write. My advice is to write it as well as you can and even run it past your critique group as soon as that first draft is finished. Make whatever changes you feel will improve it then put it aside while you revise your manuscript. When query time gets closer, you can look at it with fresh eyes and polish it. After drafting your query letter to an agent, always wait at least twenty-four hours before sending it. Just as time allows you to see your manuscript, synopsis, and book blurb more clearly, time will give you a fresh take on that letter. I personally have caught careless errors just by waiting one day. I can’t say I’ve caught them all, but I’ve definitely improved my submissions this way. Trickle your queries. Starting with your A-list, send your query to only a few agents, maybe three to six. (Obviously, personalize each letter, and follow each agent’s submission guidelines.) From my experience, query letters improve through the query process. This means that the eleventh agent you query may be seeing a sharper letter than the first one, but I still believe in starting with the A-list. Having only a few letters out at once also helps gauge trends. If, for example, three out of five agents tell you that your protagonist is too unsympathetic, I’m betting she is. If you haven’t already wallpapered New York with query letters to all your favorite agents, you can revise your manuscript without having to delay other agents who request pages of a manuscript that you no longer feel is query-ready. Remember not to get too discouraged when an agent rejects you. It’s business and nothing you should take personally. That said, the agent hunt is a bit like dating, and it can take a while to find Mr. or Miss Right. How about you? Do you have any tips you would like to share? I go running with Debra, a good friend of mine, two or three mornings a week. After a run, I’m always glad I went because I know I’ll be sitting and writing most of the day. But before the run? I’m getting pretty good at avoidance. Take Monday morning. I called Debra to see if we could go to a coffee shop and skip the run. Since we had already reserved time on the calendar, I knew we were both free. Why exercise on such a hot day when we could spend that time drinking iced tea and eating cream cheese danishes? Debra, who is less wimpy than I, said we should run. As I was reluctantly putting on my running shoes, one of my son’s T-shirts came to mind. It says, “Come to the Dark Side. 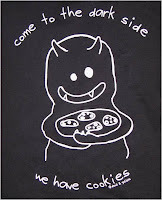 We have cookies.” The shirt has a little devilish character with a grin and a plate of cookies. I related to the guy with the horns. So what does this have to do with writing? Not much, but it reminded me of the avoidance tactics that can go along with writing—or not writing. I, too, have felt the sudden need to scrub the tub or do the laundry to avoid working on a sticky scene. I fight this impulse by keeping office hours with writing time blocked out on the calendar. Having it scheduled allows me to embrace my writing hours with all my energy and little distraction. Even my close friends know not to call when I’m writing. Short of an emergency, everything else can wait. That’s important because sticky scenes lose their gumminess much quicker when I deal with them right away, and I work best in general when I know I have a nice chunk of time. My recommendation: stay away from the Dark Side by looking at your calendar ahead of time and deciding how much writing time you can possibly block out. Mark the calendar if it helps you or your family members keep your writing schedule in mind when plans are being made. *According to a site I found, this is not the correct quote from the movie although it is the way most people remember it. Doesn’t it make you want to watch the movie again and see for yourself? Not during writing time, of course. Maybe instead of that next run. I’ll bring the iced tea and the cream cheese danishes! And it’s about time. I became fired up about starting a blog in February when my regional Society of Children’s Book Writers & Illustrators (SCBWI WWA) had a professional series meeting educating us on this very topic. That night—or morning, technically, since it was about two a.m.—I got out of bed and jotted down possible topics I could write about. But then I sat on the idea. I had my new novel to work on, and I decided I should wait for my first book deal. A few weeks ago, I had the opportunity to meet Nathan Bransford, a literary agent at Curtis Brown, Ltd. whose blog has a huge following. He is so nice, as one would guess from reading his posts and comments, and he suggested I start blogging sooner rather than later. Well, who am I to argue with Nathan Bransford?! Besides, I know it will be lots of fun, and I love connecting with other writers. I decided to e-mail Holly Cupala, an internet-savvy YA author from SCBWI WWA. After a warm and helpful response from Holly, here I am. Or here it is. It’s a... bouncing, baby blog! What will I do here? 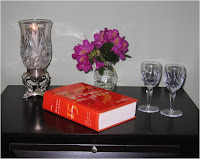 Most of my posts will focus on my day to day thoughts and ruminations about writing and books. While I’m merely an aspiring YA novelist, I’ve been dedicating serious time and energy to my writing for six years. I plan to offer tidbits and opinions on some of what I’ve already absorbed, knowing I have so much more to learn along the way. I’ll share experiences and even conduct the occasional author interview. Of course, all my writing projects change and grow as they develop. I assume this one will be no exception.